We can sometimes be fussy with where we eat or what we eat and very often find ourselves asking to have things changed – such as removing an item from the meal. This can sometimes prove to be an issue especially if the restaurant don’t make everything in their kitchen and have some meals prepped before you order. However all Denny’s Diners cook everything fresh and everything is cooked to order, so changing a couple of bits is no problem! We both would recommend trying a Denny’s (if you can) because we feel sure that you would find something to enjoy. We (between us) would eat anything from the Denny’s menu, and both of us can be fussy! 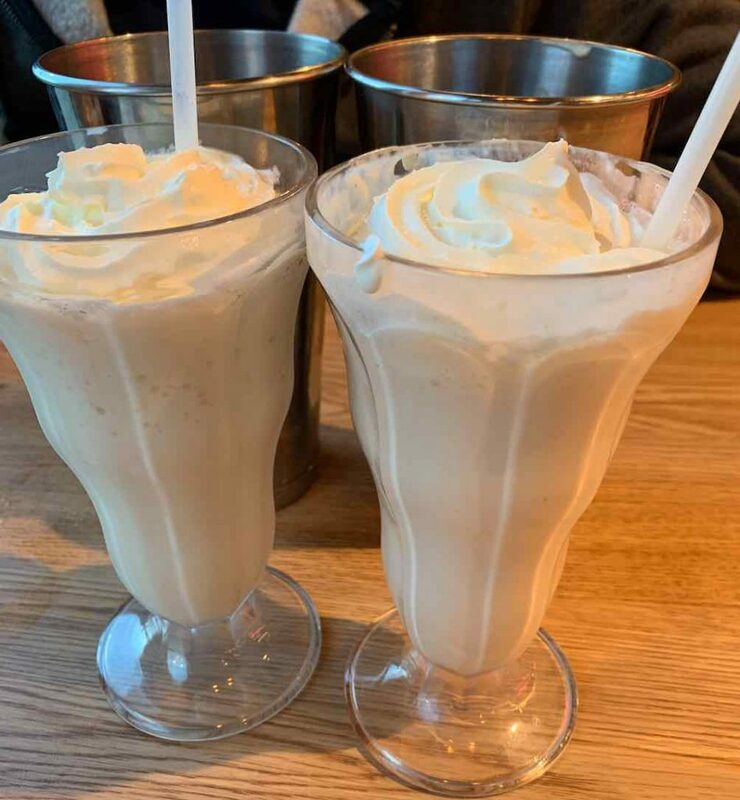 Peanut Butter Milkshake and Vanilla Milkshake – 100% recommend getting! So we LOVE LOVE LOVED Denny’s in America, this was the first place that we tried it, when we went out early last year. Just after we got back from America we were super happy to discover that the UK had got its first Denny’s Diner. 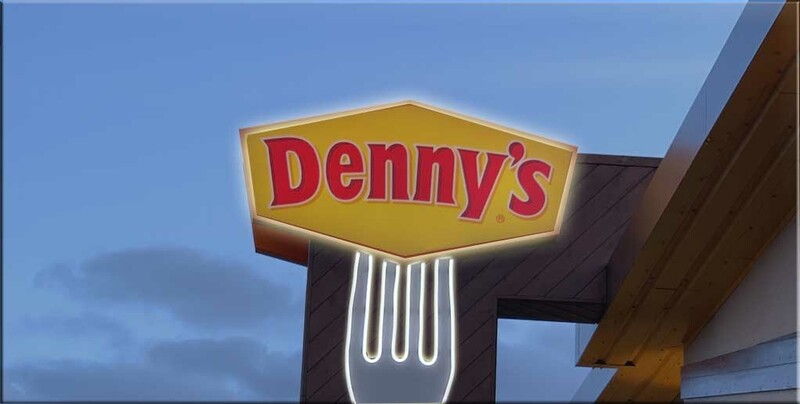 The first Denny’s in the UK was opened in Swansea, Wales (on December 27th 2017). We decided that since we were missing America so much and as Denny’s is Americas Diner, that we would do the trip to Swansea – because why not? The amazing food we had in the American Denny’s. Now, we decided to drive down to Swansea (which took about 5 hours) and head straight to Denny’s for food. This was great because the drive worked up an appetite, and since we got there for 10am we wanted a nice big breakfast (a Denny’s delicacy). We then had a small shopping break and returned again to Denny’s for a second meal – since we lived so far away and probably wouldn’t be able to return soon. Needless to say we didn’t eat much of the second meal as we were still so full from the first one! But we ordered waffles and chicken with a side of puppy pancakes. The food was just as great as in America! Having filled ourselves to the brim – and leaving half the waffles and chicken, and pancake puppies – we set off back home. Yes the same day, yes it’s a long drive and yes we were shattered at the end of it. All in all we did a 5 hour trip, had 2 Denny’s meals and then did the 5 hour journey home – all in one day. Yes it was worth it, if you haven’t had Denny’s then you need to try it, and then you will understand why we drove so far for some great food! The waffles and chicken that we couldn’t finish in Swansea! This time Denny’s opened their second UK store in Glasgow, Scotland (on 10th December 2018). Now for us Glasgow is a BIT closer (still a good 4 hour drive), so we thought ‘yes lets go’. However there had to be changes (after how tired we were last time), so we booked a hotel and made a weekend of it. A little weekend in Glasgow, and a great trip to Denny’s, perfect. After being unable to eat a second meal last time we learnt our lesson, so this time we went to Denny’s for dinner on Saturday evening and then had a long 15 hour break and returned for breakfast on Sunday morning. To read all about our ‘dining experience’ at Denny’s in Glasgow, a post will be coming later in the week. 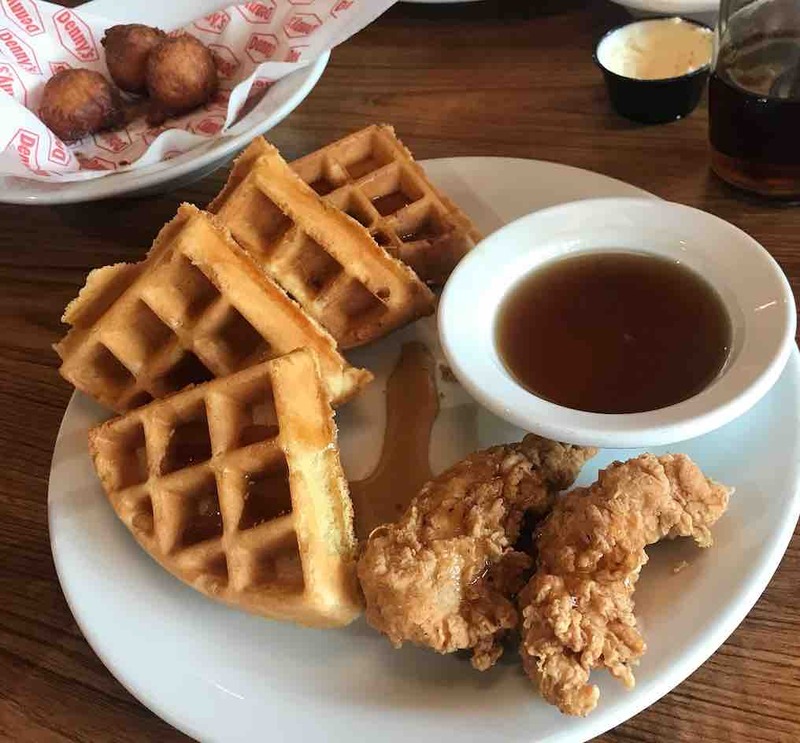 This post is one you will want to read – it was great fun and we would recommend a visit to Denny’s for anyone and everyone!! Don’t forget to follow us on Twitter and Instagram to see what we are up to. Previous Previous post: Hack Green – The Secret Nuclear Bunker. Great post! I’m a bit hit and miss on Denny’s – but it’s great that they’ve opened restaurants in the UK! I’ve only ever had breakfast at Denny’s (and only on New Jersey) and I LOVE the pancake puppies! My boyfriend and I always get them – and we used to work at IHOP so that’s saying a lot! TBH I only ever thought about breakfast when I thought of Denny’s but fancied trying something different and it did not disappoint! The chicken was – hands down- the best chicken I’ve eaten! You used to work at IHOP? What was that like? I LOVED IHOP when we were in Florida, that was the first place we ate at in the USA.